I’m challenging you to eat one meal-sized salad every day for 5 days. 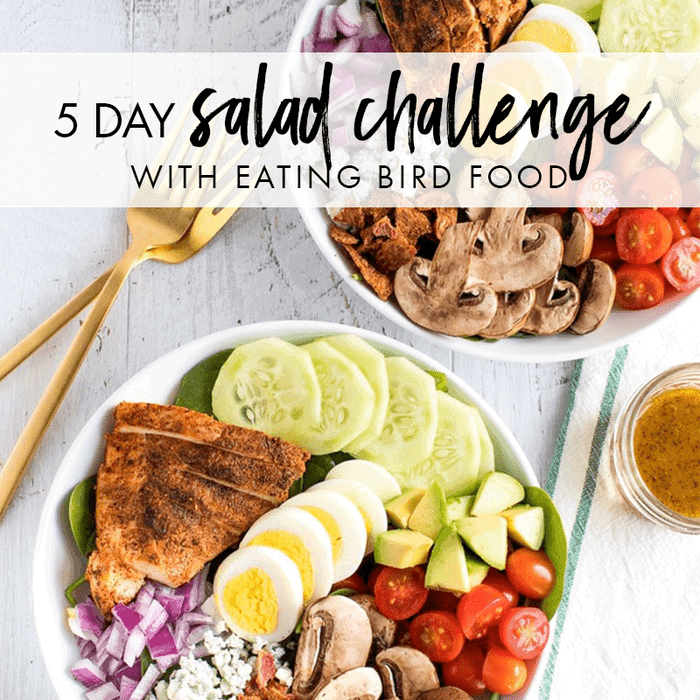 Are you in for the 5 Day Salad Challenge? In case you’re new around here, I’m Brittany, founder of Eating Bird Food and the #saladeveryday movement. One of my go-to tips for eating healthier and helping my body reset in a gentle way is to have at least one BIG salad per day. I don’t just have the hashtag for fun, I truly do eat one salad every day. I am getting in a variety of fruits and veggies, getting enough fiber, and maintaining a healthy weight. After seeing what an impact salads had on my life, I started encouraging others in my life to do the same! Enter: this 5 day salad challenge. I don’t want to this to feel overwhelming so there’s no obligation to make all the recipes I recommend or have a completely different salad each day. 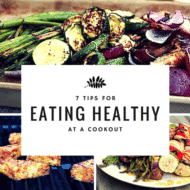 I want to give suggestions, but I know that some people will have dietary restrictions or simply won’t have time to make all the recipes. No worries! Make this challenge your own. 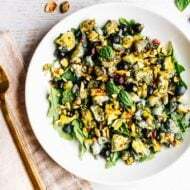 Have one meal-sized salad every day for breakfast, lunch or dinner. Your salad must have tons of veggies, a good source of protein and a healthy fat. <–I share tips for making a meal-sized salad in the guidebook you get when you sign up! Your salad doesn’t necessarily have to have a base of lettuce or greens, although it certainly can. Share your salad creations via social media using the hashtags #saladeveryday and #eatingbirdfood. Don’t forget to tag me so that I see the post! Are you in for the salad challenge? Let me know in the comment section! Yay!!! I’m in! Such a great way to get over a “I can’t see just salad anymore”-period! Yay!!!! Monday can’t come soon enough. I am totally up for this challenge. I need to eat ore salads. My only thought is I’d like to replace the meats with beans and wonder if that would be fine? Hi Marry. Yes, please feel free to replace the seafood or meat with beans. That will work perfectly! I’m in! Can’t wait! It’s a joy to see all of these yummy, inventive salads!! Yay! It’s going to be a fun 10 days of salading. I’m in! I’ve been in a salad rut – I usually eat a big one everyday for lunch anyways – so this seems like a good way to get some recipe inspiration and switch it up. Woo-hoo! I’m so excited you’re joining in on the salad fun. I love this idea! I would have no problem eating a salad for a meal every day when they look as good as these do. The Kale and Cabbage Pad Thai Salad has my name written all over it! Thanks so much, Sarah! 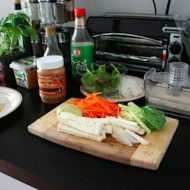 The Kale and Cabbage Pad Thai Salad is one of my favorites!! going to be travelling during this time but sounds like a good way to get back on track after the holiday!! Heck yes I am totally taking this challenge! Thanks girl! Yay!! Can’t wait for Monday. Hooray! So glad you’re in, Amanda. This is the nice blog. For more information about the whole natural food for fitness please click on this link. Very use full tips. Yes I’m in! Great idea. Thanks! All in!! I eat meal-sized salads every day anyway!! Heading to Wegmans to stock up for the week! I can’t wait to try your recipes, Brittany! Great idea! I’m traveling for about half the challenge, but have access to some good salad bars. Keep eating clean! I’m in and got a kickstart by having a big arugula and quinoa salad last night!! Can’t wait! This is a great idea! Even if you can’t make each and every salad during the challenge you can still use this as a recipe reference! The Grilled Salmon and the Guacamole salad look mouthwatering! My mom and I are going to do this the week of July 25th! I am so excited and can’t wait to recreate these salads!